GLAMGLOW Supermud: This mask is more suited to oily/acne-prone skin but I use it as a spot treatment. It literally draws the gunk out from under my skin but it doesn't leave it inflamed or irritated. I apply it to freshly cleansed skin, leave for around 20 minutes before rinsing and then follow with a spot cream if necessary. I have only ever owned mini pots of this mask that have come as part of sets because I don't need a full size pot, but for anybody with acne-prone skin, this would be a real winner. Omorovicza Deep Cleansing Mask: This was the product that started my love affair with Omorovicza. I had toyed with the idea of buying something from the brand for quite a while before actually taking the plunge and I am so glad that I did. The products all contain Hungarian mineral waters, which makes the products very gentle and anti-inflammatory. This is a clay mask that I can actually apply all over my face for a deep cleanse because it doesn't leave my skin feeling tight or sore and it is much lighter in texture than other clay masks that I have used, making it suitable for sensitive skin. When I use this, my skin looks almost transparent and very calm. I love it! If you are interested in trying some Omorovicza products but are scared by the price tag, then take a look at their Christmas Sets, which contain a number of generous sample sizes at a reduced price. Read more here. GLAMGLOW Flashmud: I picked this mini tub up in Sephora when I was in Orlando in June and wondered if it could be very different from Youthmud, which is also an exfoliating mask from GLAMGLOW. Flashmud is more of a brightening treatment and it is very different from Youthmud in terms of texture and results. Flashmud aims to brighten the skin and improve uneven texture. My skin looks a little brighter when I use this, but nothing outstanding. It has a creamy texture with some mild grittiness that polishes the skin without tearing it but it is not something that I would repurchase, simply because I have masks that perform better in terms of exfoliating & brightening. REN Glycolactic Radiance Renewal Mask: This is a mask that I have repurchased several times because it is one of those products that give instant results. It uses AHAs to de-congest, exfoliate and renew the skin. My skin glows when I use this and although I am not crazy about the sticky texture of it, the results are worth it. I have sensitive skin so I do experience some mild tingling, however it doesn't leave my skin looking or feeling inflamed. I think that all skin types, apart from very sensitive, would love this mask. Oskia Renaissance Mask: This is probably my favourite face mask that I have ever used - bold statement! This is like the big sister of the REN mask in so far as it is similar but the results are even more apparent and for anybody who has skin texture issues - you need this mask in your life! It has a creamy gel texture and is peach in colour, but when you massage it into the skin, it turns white and at this point, you stop massaging as it is beginning to work. I leave this on my skin for around 20 minutes and in that 20 minutes, my skin is transformed. The fruit acids exfoliate and de-congest the skin and the lactic acid softens the skin and reduces the appearance of fine lines. My skin instantly glows, my pores are less visible and my skin is smoother and brighter when I use this mask. Over time, the texture of my skin has improved using this mask so if I could only use one mask for the rest of my days it would be this one. I have repurchased several times already and will continue to do so forever. 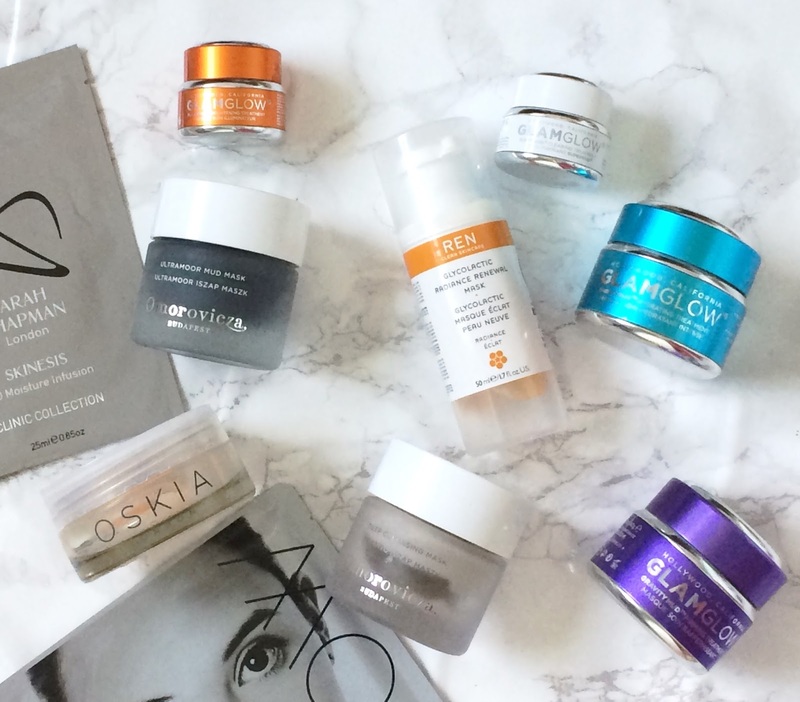 For Irish readers, I find Beauty Bay to be the cheapest site for buying Oskia products. Omorovicza Ultramoor Mud Mask: As I said earlier in this post, I love Omorovicza Deep Cleansing Mask and when I was sent this mask, I wondered if it could be very different but it is! I have previously described this mask as being like Spanx for your face because it tightens, firms and tones the skin. If you are over the age of 30 and like the sound of the Deep Cleansing Mask, then I would recommend that you choose this one instead as it has the deep cleansing benefits of the previous mask but it also firms the skin and leaves it looking radiant and glowing. It is gentle on the skin, as all Omorovicza products are, but the results are phenomenal. My mother, who is in her 60s, used this mask and said that she has never used a product that gave such immediate results, especially on her neck. This would be the ideal product to use before a special event when you want your skin to look its very best. You can buy it here and receive some free samples too. GLAMGLOW Thirstymud: This is the only moisturising mask that I currently own and it is one that I have repeatedly repurchased over the last two and a half years since I discovered it. It smells like a combination of coconuts and caramel and as soon as I apply it, I can feel my skin drinking it up. It is the ideal mask to use after a clay mask or a peel because it soothes and really delivers lots of moisture. I like to use it as an overnight mask and I wake up to plump, happy skin and it doesn't stick to the pillow or my hair! If you have dry skin, do yourself a favour and buy this mask! Sarah Chapman 3D Moisture Infusion Mask: Sheet masks are really having a moment in the beauty world and I am very late to the party on this one. I must admit that I don't find sheet masks the most convenient products to use, but on the plus side, they do make you lie down and relax for fear of the mask falling of your face otherwise! They are also perfect for travelling as they won't take up much room in your wash bag. This Sarah Chapman mask delivers a powerful and instant dose of moisture to my dry skin and leaves it looking very plump and glowing. If you are keen to try some face masks but don't want to spend too much money on them, try BBeautyLtd, where the Korean and Japanese masks are priced at £2.49. Obviously not everybody has a 'face mask wardrobe' like I have, but I would love to hear your thoughts on these masks? Are masks part of your skincare routine? I would love to hear any recommendations you might have for me? Please tell me in the comments below! Some other masks that are currently on my wishlist are: Estée Lauder Advanced Night Repair Sheet Masks, Omorovicza Instant Plumping Mask, Pixi Nourishing Sleep Mask and Aurelia Cell Revitalise Rose Mask. Have you tried any of these? I would love to hear your thoughts!